About 1900 this company enjoyed a very good reputation and was a supplier for The House of Lords in England and for The White House in the USA. Nowadays Meukow belongs to the CCG group (Compagnie Commerciale de Guyenne or Compagnie De Guyenne, CDG) and it is the flagship of it. Established in 1862 by two brothers, Auguste-Christophe and Gustave (Karl) Meukow, together with another partner, Lervoire. 1865 Lervoire passes down his shares to Henri Bouraud, who became partner. In 1874 Bouraud handed his share of the company to the Scotsman Thomas Alexander Shepherd. Thomas Alexander Shepherd was born in Adelaïde, Australia where his father, Thomas Shepherd, had made his fortune. 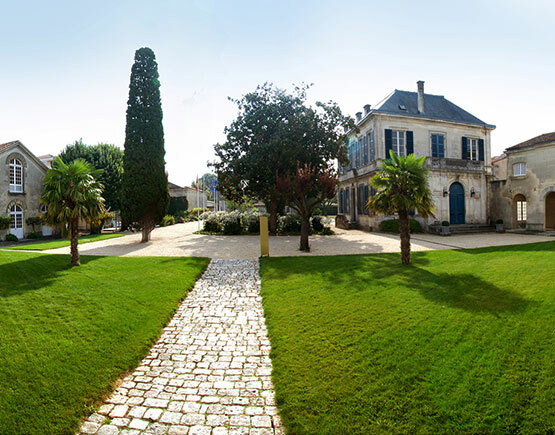 In the late 1830´s he had bought a large plot of land in a time that Adelaïde was just beginning to develop. He built the Marybank house, that still exists today. Around 1850 the family returned to Scotland. 1878 Auguste-Christophe Meukow died. In consultation with the heirs Shepherd acquired full ownership of the company. 1880 Shepherd handed the company over to Gustav Klaebich. 1899 (about) Meukow launched ‘Cognac Grande Champagne, marque Napoléon’. But it was Courvoisier who knew how to commercialise the image of Napoléon in the first half of the twentieth century. In 1914 the French State seizes the company from Klaebich, because he was German. 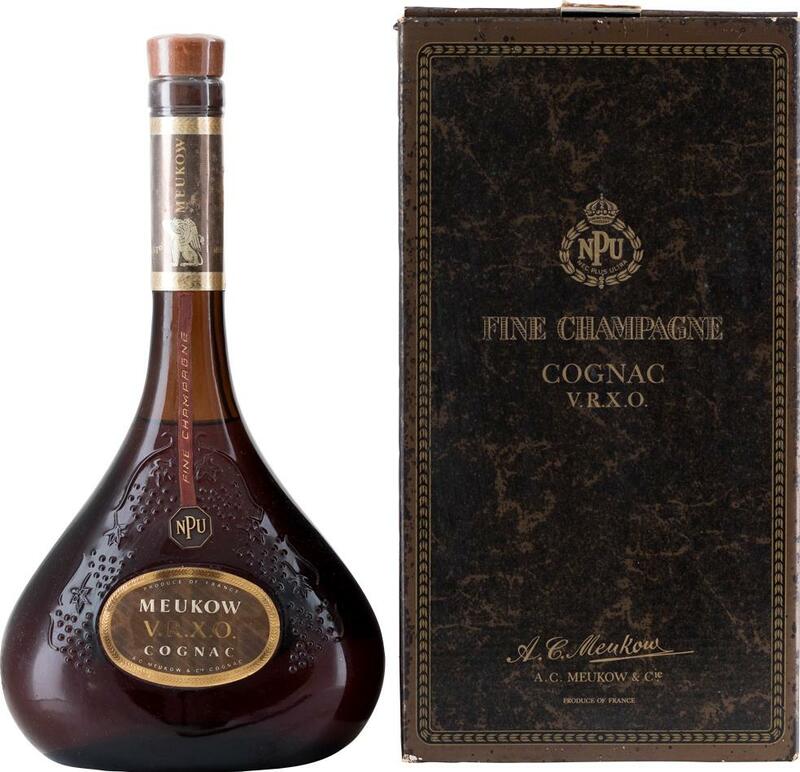 In this period Meukow is one of the biggest cognac houses. The new manager for Meukow is Harold Butler. After the war in 1918 the widow of Thomas A. Shepherd acquires the ownership from the French State. Harold Butler remained manager for more then fifty years; he also becomes a shared owner. Duncan lauder Sheperd, son of Thomas Alexander, becomes the owner together with Harold Butler. Around 1940 Duncan Lauder Shepherd and his wife and suns fled to England. His daughter Daphne marries with André Villesuzanne. Together with Harold Butler they continue to lead the company. 1968: Meukow encounters severe financial difficulties. Harold Butler sells his shares to André Villesuzanne, who also inherites the rest of the shares from Shepherd. André Villesuzanne becomes sole owner. 1978: sailes are down to almost zero. 1979: Michel Coste of the CCG-groupe buys Meukow and revitalises the company. 1995: Michel Coste designs a new logo for Meukow: the panther. Nowadays the Meukow mark sells as much as in the beginning of the twentieth century. They possess a rather big vineyard in the Petite Champagne district, but most of their cognac is being bought as eau-de-vie: 70% Fins Bois and 30% from both champagne districts. During the first two years the cognac is stored in new casks of limousin oak; after that the cognac is put in old casks, half of it made of Limousin oak, the otherhalf of Tronçais oak. When necessary they add sugar, caramel and wood extracts. VS this used to be a fine champagne; nowadays it is 100% Fins Bois. Also some old cognacs: Rarissime, Drapeau, Fin de Siècle, Nec Plus Ultra, 1964, 1965, 1970 and NPU Baccarat. The Meukow House, established in the 19th century. 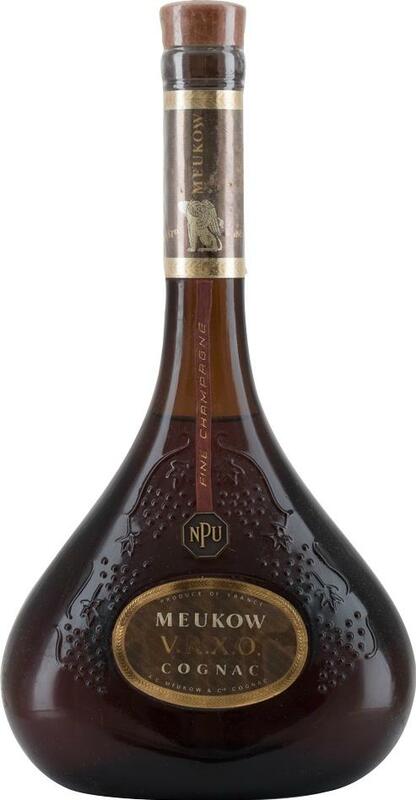 In 1850, Auguste-Christophe and Gustav Meukow, two brothers from Silesia, were sent to France by Tsar Alexander II of Russia with orders to secure the supply of cognac for the Court. After several voyages, they decided to set up a commercial office in the town of Cognac and founded the A.C. MEUKOW Co. House on 1 August 1862. 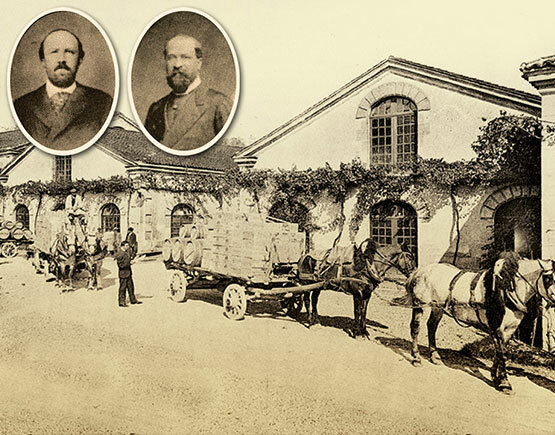 Managed under the influence of illustrious shareholders such as Henri Bouraud, who was Mayor of Cognac from 1849 to 1869, the company increased from the very beginning as evidenced by the prestigious events held around the world. In 1979, Meukow became part of the Compagnie de Guyenne family owned and independent group, founded in 1969 by Michel Coste. 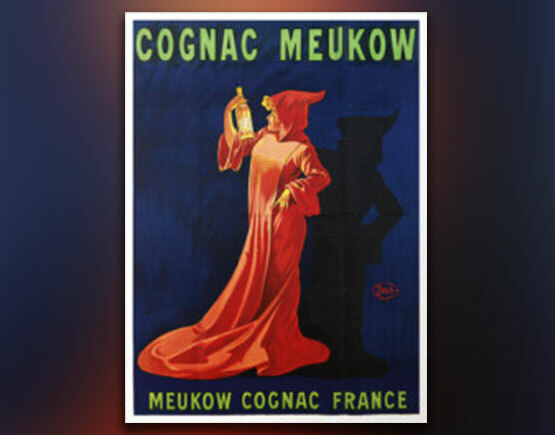 Since that time and thanks to the support of the commercial structure of the group, Meukow Cognacs continued to beef up and develop their range. Meukow, in the present, is distributed in more than 80 countries. 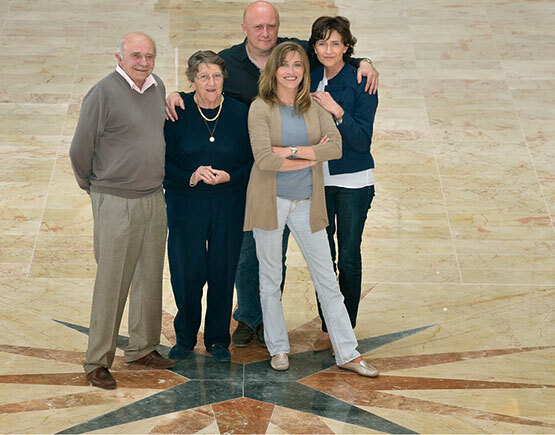 Nowadays, Philippe Coste, son of Michel, supported by his two sisters, Marie-Laure Brugerolle and Céline Viard, manages the business. With the aim of reinforcing the unique identity of Meukow, Michel Coste searched for a symbol that would evoke the exceptional qualities of the cognac and differentiate it from other brands. 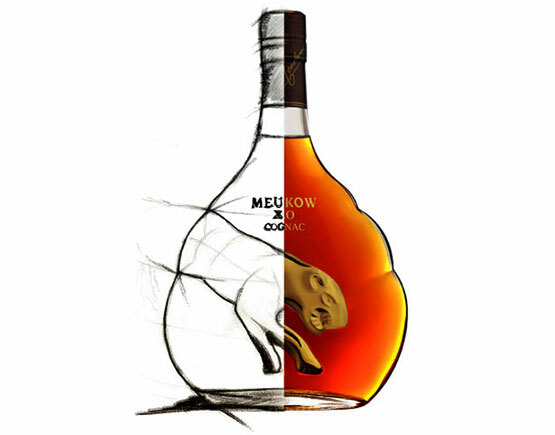 The Feline bottle, adorned with the panther, which became the icon of the Meukow brand, was created in 1993. This magnificent creature perfectly symbolizes the power, elegance, and suppleness that are the intrinsic qualities of Meukow Cognacs. Awarded “Pack d’Or” twice by the National Institute of Design and Packaging, the Feline bottle is an icon recognized as being evocative of quality and desirability. 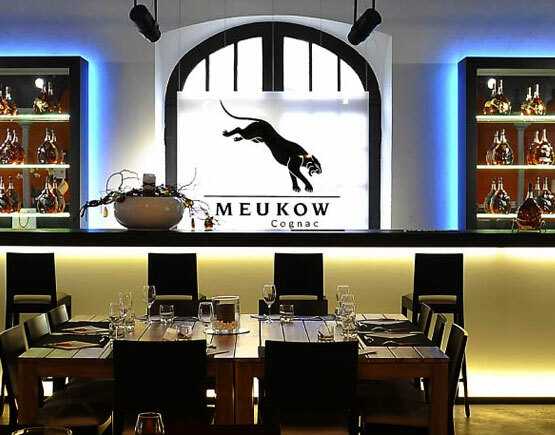 The perfect balance between power and suppleness that is characteristic of Meukow Cognacs is the result of the dedication of the Cellar Master. Anne Sarteaux, Cellar Master at Maison Meukow since 2007, continues the ancestral traditions and expertise passed from generation to generation. Following the double distillation of the wine, the Cellar Master carefully selects the Eaux-de-vie that will age in oak barrels for at least two years. These Eaux-de-vie come from the six different regions that form the cognac AOC (French Protected Designation of Origin): Grande Champagne, Petite Champagne, Bons Bois, Fins Bois, Borderies and Bois Ordinaires. As the guardian of a treasure unveiled over time, the Cellar Master rigorously monitors the aging of the cognac in the dark and humid ambiance of the cellars. 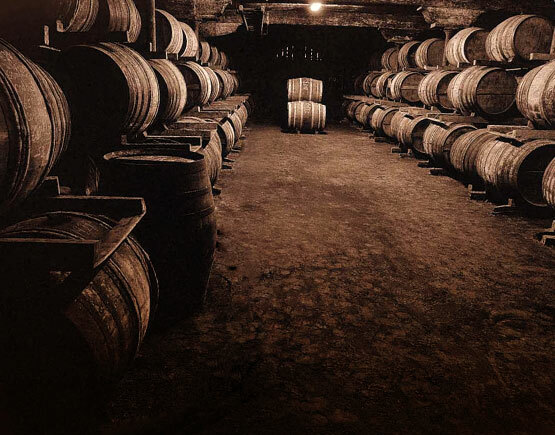 Some cognacs will age for more than 50 years in a basement that bears the poetic name of Paradis. In the heart of which alcohol vapors are slowly released over time to produce the well-known Part des Anges (Angels’ Share).